We have no shortage of new products this month at LovelySkin, but we’re especially excited about Neocutis Micro•Essentials! When it comes to LovelySkin staff favorites, Neocutis products have been at the top of our list for many years. Lightweight and luxurious, the Micro•Essentials line is sure to be no different. Here are three reasons to try these new anti-aging staples. 1. Micro•Essentials features breakthrough MPC technology. Available online exclusively at LovelySkin, Neocutis Micro•Essentials features innovative skin care technology you’ve never seen before. The foundation for the Micro•Essentials line is Micro Protein Complex, or MPC. This innovative technology uses a proprietary blend of synthetic peptides, including one brand new peptide, to help defend against the visible signs of skin aging. The micro-proteins found in MPC technology are essential to the body’s natural production of collagen, elastin and hyaluronic acid—three components of radiant, youthful skin. 2. MPC technology targets both basic and complex signs of aging. Neocutis Micro•Essentials was designed to take a new approach to anti-aging. Not only does this line help address the basic signs of aging, like fine lines and wrinkles; it also works to improve the complex signs of aging, including loss of firmness, elasticity and hydration. The result is a comprehensive skin care regimen that targets signs of aging at every stage. 3. Micro•Essentials offers a wide variety of treatments for your unique needs. Whether you’re looking for a specific treatment or an anti-aging overhaul, Micro•Essentials has what you need. Each product fits seamlessly into an existing regimen, or works with the rest of the line to further enhance your anti-aging results. 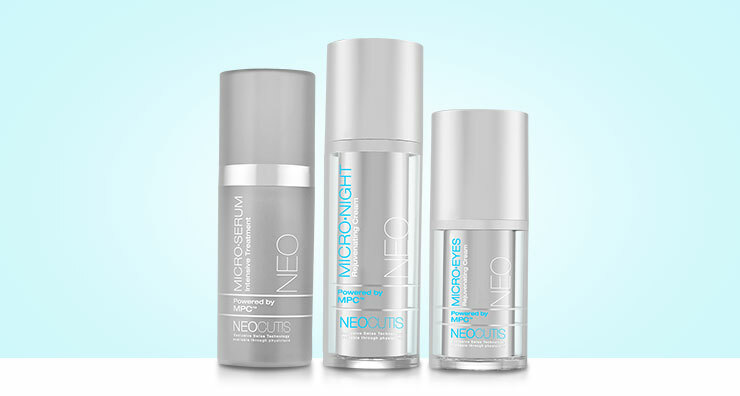 Have you tried any Neocutis Micro•Essentials products? Let us know what you think in the comments below or on Facebook, Twitter or Instagram using #LovelySkin! Kristen is a copy editor for LovelySkin who loves catching up on the latest in skin care and beauty trends. Her favorite things include cats, concerts and Harry Potter.